Welcome to 'Woods Edge at Lucaya Lane' - at the end of this quiet country lane you'll find a wonderful vacation home awaiting you. The first floor offers a 'Great Room' with living, dining and kitchen areas open to one another. A separate den, full bath and laundry are also on the first floor. From the dining area, step out onto the deck and gas BBQ. The Outdoor Shower is a Cape tradition, and a great way to rinse off after a long day at Red River Beach on Nantucket Sound. On the second floor you will find three bedrooms (Queen, Double, Two Twins) offering comfortable accommodations for up to six guests. Lucaya is very clean and well equipped. Jen & Tom Huckman - please mention 'Lucaya Lane' when calling - thanks! Central Air will keep you cool in the Summer! Bed and Bath linens happily provided. Please let me know if you are flying in, and I will gladly arrange for beach towels. Great week! Great vacation house! We had a great week. The house was full of all the things we needed ( linens, beach towels, beach buggy, beach toys, chairs, and umbrellas). Super convienent to the beach; walkable, which the kiddos loved. Had a great time! Highly recommend! Wonderful, comfortable home, convenient location. Great house with all the amenities you need for a family cape vacation. Loved the beach access and outdoor shower! The Lucaya property is secluded from the main road (Deep Hole Rd) and therefore very quiet. The house has 4 bedrooms and a pull out couch which was more than enough room for our family. It is exactly as advertised. Overall the property is clean and ready to move in with all linens and towels provided. It is also well maintained on the outside. The manager called us the night before arrival to assure that all questions were answered and to provide information on access to the property. Our family has been going to Red River Beach for about 15 years, it is well maintained, great for sea glass and shelling. Perfect for small children as waves are moderate to small depending on tide. The beach now has a great hot dog and hamburger stand. The ice cream truck drives by multiple times each day. Our grandson loves Harwich Port which is close by because of the toy, book and candy stores. There are a number of good restaurants in town. Our favorites include; Castaways, Brax, Land Ho, Georges Pizza, Ember, Hot Stove, 10 Yen and of course School House & Sundae School Ice Cream. If you prefer to eat-in the property is close to major grocery chains. The Weber grill is a new model. The property is a half hour from the Yarmouth Area with mini-golf, Pirates Museum, and a Cape Code Inflatable Park. Kayaking and go-carts are also nearby. Our family would definitely recommend this property. Jen and Tom are excellent hosts and very easy to communicate with. The house is quite large with plenty of room and super clean. Plenty of room to sit out on the deck, grill, and play games.Beach is 5 minutes away. Our only negative is in regards to beach. Nice beach (Red River Beach) but water shoes a must, many shells and rocks the first 3-5 feet. However the house and amenities top notch. As first-time renters at Lucaya - we were thrilled with the home and our week's stay. We hosted a family gathering on the evening of the 3rd and were entertained by relentless fireworks from Red River Beach and from local residents at an adjacent pond. The home is great for a good night's sleep thanks to central air conditioning and spacious bedrooms. It is very clean and well equipped. The deck is a fantastic spot for morning caffeine and is the hideaway that really makes you feel like you are on vacation. The walking distance to Red River allows for a drop-off of all the beach gear and family members coupled with a walk-back, that saves the cost of a beach sticker. 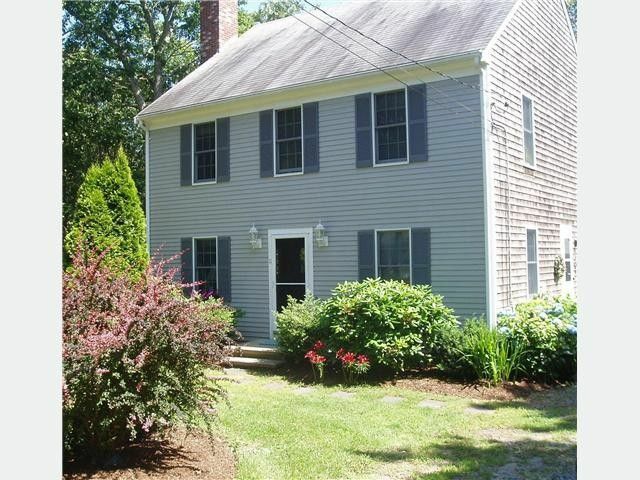 Proximity to Route 28 and short drives to either Chatham or Harwich Center is also a plus. Lucaya lane residents very quiet. Location, location, location. Walking down to the beach in the morning quiet before the crowds arrive was a major bonus that I'd never taken advantage of due to distance from the beach at previous year's rental locations. Enjoy! Great Location - Very Clean - With All the Extras! My wife and I stayed here for a week with our daughter, son-in-law and their two 18 month-old boys. It is a short walk to Red River Beach which is a great middle-sized beach. Lots of room to play and walk. Surf is pretty gentle. The house itself has AC which came in handy for the first humid part of the week, especially at night. The house was VERY clean, the beds comfy, and the kitchen fully stocked with appliances and plates, silverware, glasses and cookware. Coffee maker with filters. It is a close drive to Rte. 28 and the "downtown" of Harwich- but located down a couple of side streets, at the end of a side street, so no road noise. We went into the basement when we arrived and were pleasantly surprised at the number of beach toys, boogie boards, beach chairs and even a wheeled beach caddy to take it to the beach. We brought our own Stair-gate but found there was one of those in the basement as well! Our first night there we had about 10 family members over and brought home cooked and cracked lobsters form George's Seafood (relatively close by). There was ample room in the dining area and picnic table on the back deck for our get-together. There are TV's in some of the bedrooms and a large HD in the living room. Strong (complimentary) Wi-Fi signal. Jen and Tom are a pleasure to work with - very nice, professional with good communications, information and reminders.